This article explains how we connect multiple electrical receptacles in one electrical box or at one location in a building. How are the additional receptacles connected together and where are the line in and load out wires connected? We describe how to wire an electrical receptacle by making the right connections between individual electrical wires and the proper screw or clamp connectors on the electrical receptacle device itself. We also describe connecting the ground wire between the circuit grounding conductor, receptacle ground screw, and the electrical box (if metal boxes are used). 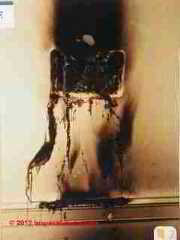 Watch out: Electrical components in a building can easily cause an electrical shock, burn, or even death. Even when a hot line switch is off, one terminal on the switch is still connected to the power source. If your two plug ins (two electrical receptacles) are located in the same electrical box (we call this a "quad" electrical receptacle installation since each individual receptacle provides connections for two wall plugs), you'll want to wire the hot and neutral to one pair of screws on the first receptacle, and use short black and white jumper wires to connect the the proper terminals on the first receptacle to the second one in the same box. That's a perfectly acceptable use of the second pair of screw terminals you see on the receptacles. The ground wire can be continuous, tying the two ground screws on the receptacles together and onwards to the circuit ground. However a better practice when wiring up a quad-plex of electrical receptacles is to place left and right or upper and lower receptacles on separate electrical circuits - thus reducing the chances of overloading the circuit when many things are connected simultaneously. There are two approaches: you can wire the left and right duplex receptacles each to different individual electrical circuits, or you can wire the upper and lower half of the pair of duplex receptacles to different electrical circuits. 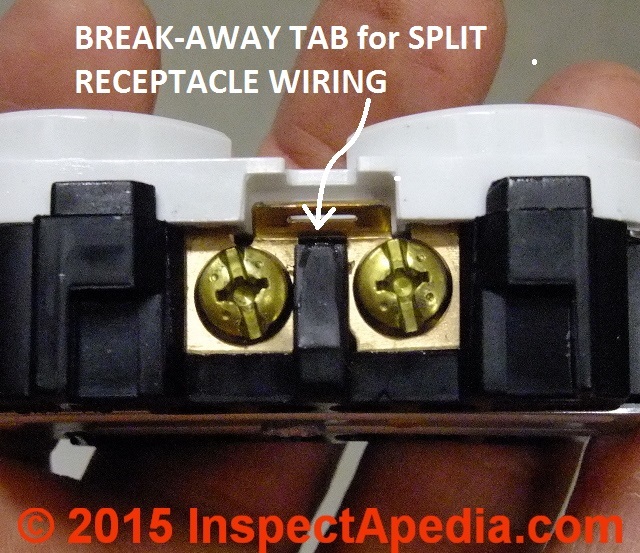 To wire the upper and lower halfs of a pair of duplex receptacles to two different circuits (that's not what I would do) you'd need to break the connector tab on the receptacles hot and neutral sides so that the upper and lower receptacle halves are no longer common. Then you will wire one circuit to the each receptacle upper half and the other circuit (separately fused) to each recepacle's lower half. Details of this approach are at ELECTRICAL SPLIT RECEPTACLE WIRING. What I prefer to do in a quad gang box like the one shown here is to wire individual receptacles to individually separate electrical circuits. So within a given receptacle the upper and lower half are on the same circuit. 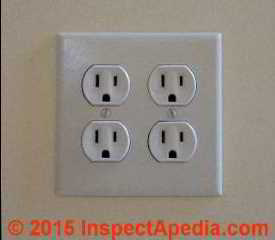 Watch out: do not mix electrical receptacle types in the same box. The receptacle shown at left is a contemporary 15A 240V receptacle (wall plug or "outlet" as some say) that includes a grounding conductor while the receptacle shown at right is for use on un-grounded circuits. You'd use the right hand receptacle if repairing or replacing a wall receptacle on an ungrounded electrical circuit such as knob and tube systems. 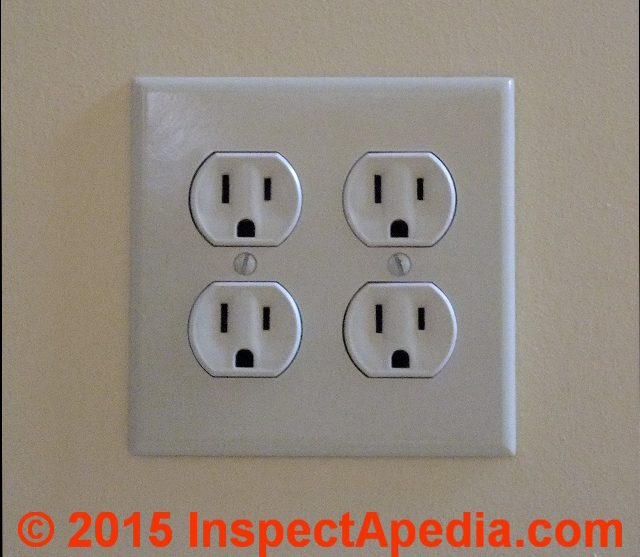 Question: are electrical junction boxes required for wall plugs? Yes, Thomas, electrical devices such as switches and receptacles (wall plugs) need to be mounted in a code-approved plastic or metal receptacle (box) for fire safety as well as to assure that the device is mechanically secure. In fact when you purchase a "wall plug" you'll see that its metal mounting ears and screws are spaced and designed to connect to an electrical box. Watch out: while it's physically possible to install a wall receptacle or "plug" without using an enclosure, doing so is dangerous, risking fire and shock, and of course, it's also illegal in virtually every building code jurisdiction. Take a look at our photograph above: a fire was contained within this electrical junction box. Had the box been omitted there is a good chance the fire would have spread to the building itself. When we hear a question like this it makes me very afraid for you and for future building occupants - as amateur electrical wiring is dangerous. 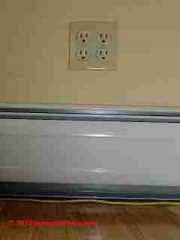 Question: how do I install multiple electrical outlets (receptacles) along a wall? Mike, if your comment is a question of how to put in more than one outlet along a 12 foot wall, yes it's perfectly permitted to exceed the minimum number of receptacles along a wall. The wiring system is unchanged except that in some cases I recommend installing two different circuits and alternating which outlet is served by which circuit. That avoids overloading one circuit if you are plugging in lots of devices in one area. If you are going to install more than a single duplex receptacle in one location I prefer to use the dupelx-receptacle wiring approach described in the article above. Two or more such receptacles can be ganged together in a box provided wiring, circuit ampacity and connections are properly selected and installed. A common location where we find duplexed receptacles is at kitchen counters. In those installations best practice is to power each of the pair of receptacles on different electrical circuits. That permits the user to plug in and use two appliances at one location without overloading the circuit and blowing a fuse or tripping an circuit breaker. 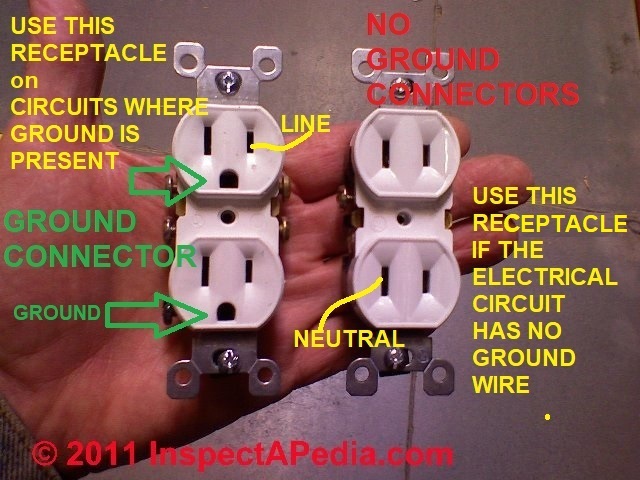 ELECTRICAL DUPLEX RECEPTACLE WIRING at InspectApedia.com - online encyclopedia of building & environmental inspection, testing, diagnosis, repair, & problem prevention advice. Referring readers to a mere paratraph nunmber that points to lengthy electrical code specification without any specifics is not helpful.